It's Okay To Stare At Danny's Candy-Covered Texas Two-Wheeler. 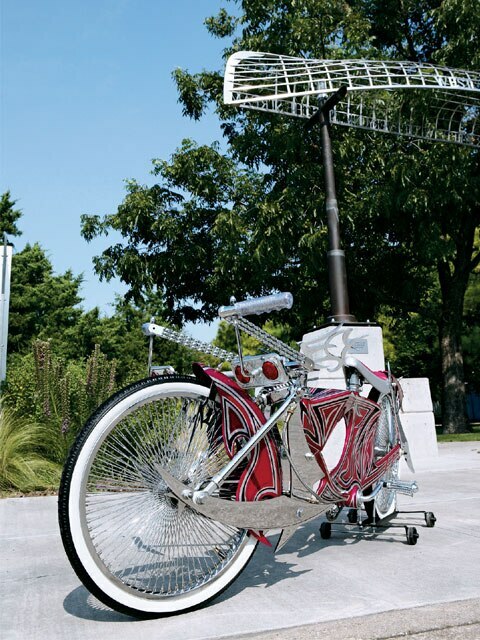 Lowrider bicycles can be an important stepping-stone for young aspiring lowriders, but other times, these pedal-scrapers are built by adults of driving age who already own a lowrider, or are in the process of putting one together, such as Danny Pechal from Houston, Texas. Danny started to build his project bike after his godson gave him a stock bike frame as a Christmas present a few years back. Danny is well known in the lowrider industry as the current vice president of Bad Influences Car Club of Houston, and he’s also been a member of the United Lowrider Association. Danny’s also a professional computer designer and he uses his CAD (Computer Aided Design) skills to make custom car and bike parts for people on the local and national lowrider scene. 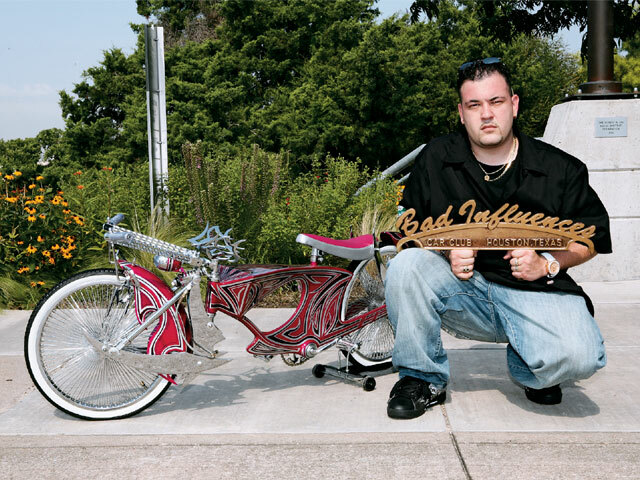 Check out Danny’s bike, “Made You Look,” which features pieces (such as fork, sprocket, fender braces, sissy bar and custom-bent steering wheel) that were designed by Danny himself and either laser cut or WaterJet cut. 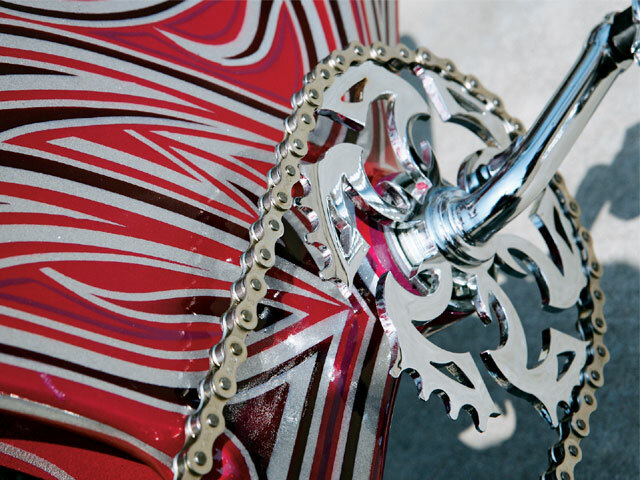 The parts were sent out to Superior Chrome in Houston for show-quality chrome. 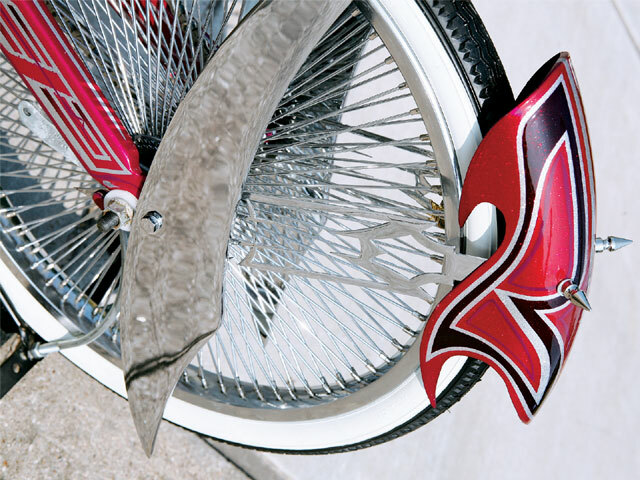 Danny’s diamond tank was influenced by his late homie, Jason Griffin, who used to race sport bikes for a living. With his friend in mind, Danny made a flowing rear end that looks like the swing arm of a motorcycle. Danny worked a lot of extra hours welding and fabricating the frame, and getting it ready for paint. Danny next took the bike to his friends at SIC713 Kustoms in Houston, where it was painted by Mike Cato, who’s also responsible for the custom fenders. 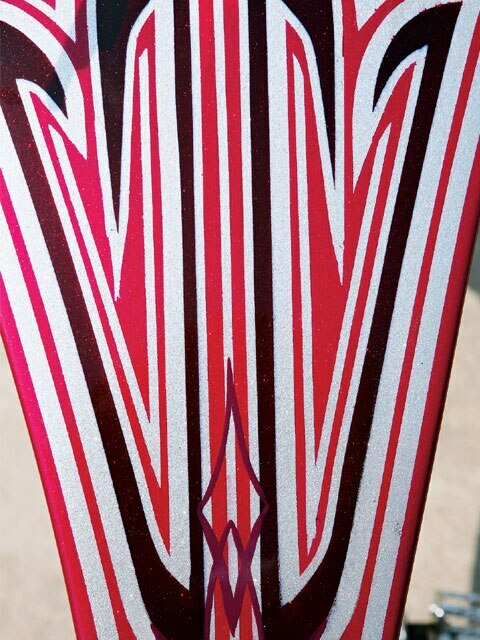 Mike laid down a clean silver flake base and then some House of Kolor candy magenta paint followed by pink graphics. Danny would like to thank his mom and brother for being so supportive of this project. Besides his blood family, he would also like to thank his other “family,” Bad Influences Car Club, as well as Shorty’s Hydraulics, Marco at Marcustoms and his homies at SIC713 Kustoms. 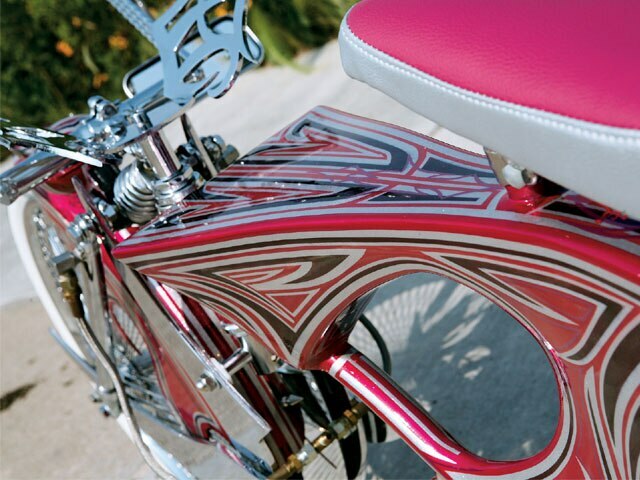 Danny has won numerous awards since the bike has been completed. In fact, Made You Look has turned heads at every show that it’s been entered.